Home Agenda Business ECAS India Fashion Jawahar Lal Nehru Lakme Politics Prime Minister Tata Women ECAS Business : Did you know cosmetic company LAKME was Nehru's Idea ? 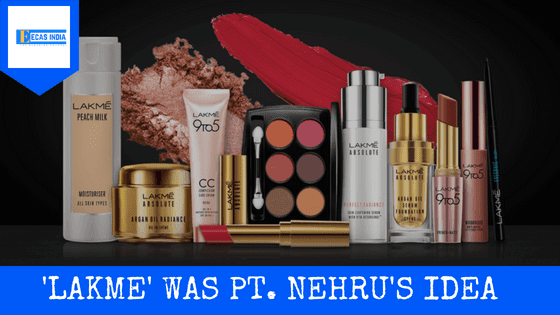 ECAS Business : Did you know cosmetic company LAKME was Nehru's Idea ? Lakmé is an Indian cosmetics brand which is owned by Hindustan Unilever. Having Kareena Kapoor as the ambassador, it ranked at number 1 among the cosmetics brands in India. Lakme started as a 100% subsidiary of Tata Oil Mills. Did you ever wonder, who was the man behind the idea of this futuristic Cosmetic Company? It was none other than the First Prime Minister of Independent India, Pt. Jawahar Lal Nehru. This was termed as a revolution for the Indian Women Society after Independence. The company Lakmé Cosmetics founded in the year 1952 with the founder as JRD Tata and the man behind the idea Pt. Jawahar lal Nehru, with the specialty of being the first cosmetic company of Independent India. The story takes the huge turn around the independence days of India when the women went crazy for the imported cosmetic materials, which led to the overspending leading to the rise in foreign exchange. The story Lakmé bloomed after the British Government left the country in the year 1947, revealing a survey in which the Indian women were crazy and were on the nine clouds for the imported cosmetic materials. But this leads to the problem. India recently became an independent country who was finding it hard to deal with the foreign exchange. Prime Minister Jawaharlal Nehru was concerned that Indian women were spending precious foreign exchange on beauty products and personally requested Jamshed ji Tata to manufacture them in India. JRD Tata came up with his company in the market and named the company Laxmi, after goddess Laxmi. But failed. The upper middle class women totally denied the products . The women were totally obsessed by foreign products as that looked classy. JRD Tata came up with a plan. He immediately changed the company's name to Lakmé. Now it was tough to distinguish the company as DESI or VIDESHI. This gave a lifeline to the company. The company was getting hit and popular day by day. Furthermore, Indian women were obsessed by beauty. He used that too in his advertisments. Later with the emergence of Indian Cinema, the company started to appoint a celebrity ambassador for the marketing of the product.